Murphy’s parents, however, encouraged her to consider closer schools, and in the end, St. Thomas’ location played a key role in her decision to enroll there, said Murphy, who with her family, belongs to Lumen Christi Catholic Community. Both University of St. Thomas and St. Catherine University administrators believe many freshmen like Murphy and their families have chosen schools closer to home because of the economy this year, which is one reason both universities are welcoming record freshmen classes this fall. This week, 1,509 U.S. freshmen are starting classes at St. Thomas, compared to 1,346 last year, making it the school’s largest freshman class ever, said Kris Roach, admissions and financial aid director. Final enrollment figures won’t be confirmed until later this month, she added. At St. Catherine University, 422 new first-year students are enrolled this year — an increase of 14 students over last year and the largest freshman class in 30 years, said Brian Bruess, St. Catherine’s vice president for enrollment and dean of student affairs. Both schools’ reputations for educational excellence, along with good merit- and need-based financial aid packages are other possible reasons for the surge, administrators say. In addition, Roach cited St. Thomas’ construction of new student-focused buildings, and Bruess highlighted St. Catherine’s strategic plan, which includes innovation and new programs. On both campuses, the additional first-year students are seen as an opportunity but also a challenge as school administrators have had to find ways to meet their needs, especially for academics and housing. A comparable number of students applied this year as in previous years, but more students who were accepted decided to come to St. Thomas, Roach said. The university receives the students it has accepted, making this year’s situation a little like an airline overbooking a flight, said Aaron Macke, residence life director and men’s soccer coach. Bruess said St. Catherine attracted more high-ability students this year by emphasizing the benefits it offers them. 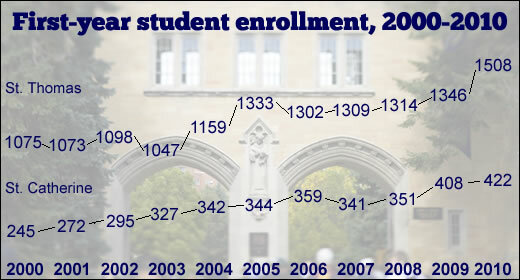 Though its overall acceptance rate has declined because of increased standards, enrollment is up, he said. The school’s ideal range for a freshman class is 390 to 420. St. Catherine’s stable, incremental growth during the past 12 years has been manageable, Bruess said. “Not many people across America in higher education could say that the profile of their new class is larger, smarter and more diverse,” he said. Though St. Thomas administrators won’t know the exact reasons for the increase until later in the year, one visible factor may be the construction of two new buildings: Anderson Athletic and Recreation Complex, which opened last week and Anderson Student Center, slated for completion in 2012. Both universities are working to ensure that first-year students will have the same academic experience as other classes without class size increases, according to Bruess and Sue Huber, St. Thomas executive vice president and chief academic officer. St. Thomas has added 29 classes and seven labs, along with additional faculty, Huber said. “We’re certainly not going to increase class size to accommodate 200 new students,” she said. St. Thomas dean of student life Karen Lange agreed. “We’re very confident that this class of students will have the same experience in the classroom,” she said. St. Catherine also added faculty and class sections for the increased number of students, Bruess said. Housing the extra students has also required special maneuvers for both schools. In addition to filling every dorm room, St. Thomas has converted lounges in Dowling and Brady residence halls to accommodate four to six students, Macke said. The spaces include loft beds, and other furniture is arranged to give students privacy. Each dorm will have 24 units of “expanded” housing, he said, adding that most years the university uses at least some expanded housing. In addition, the former fitness center on the lower level of Koch Commons is being converted into housing for 15 first-year men and one resident assistant, Macke said. To make up for the lost lounge space, St. Thomas is reconfiguring the dorm common spaces, including adding new furniture and creating meeting areas. At St. Catherine, about six residence hall lounges and computer rooms also have been converted to housing and combined with other efforts to add 83 units, Bruess said. It’s too soon to know if this year’s class represents a trend or an anomaly for St. Thomas, but it’s a sign that the university is healthy, Macke said. Lange added:?“We’re just very, very excited to have this large class.